Giuseppe (Joe) and Maria Romiti both emigrated from Italy to the United States. Joe arrived by steamship through Ellis Island in 1923 in the great tidal wave of immigration that was then tapering off. After marrying in Italy in 1949, Maria came to America by plane through New York in December, 1949. Though twenty years apart in age, theirs was a semi-brokered marriage that turned out to be a love story of soul mates. In the following four years, they would have three children: Bob, Lorenzo and Teresa. All three children would end up in the family business. Bob and Lorenzo working there daily and moving into management and finally ownership. Teresa, now a retired Baltimore County teacher, doing the restaurant’s payroll for decades. The restaurant business accidentally became the family calling in the early 1950s. Joe was a construction worker who had been in that industry most of his life. He was one of the immigrants who came to this country to find “the streets paved with gold” only to find that he was one of the ones who was going to be building those very roads. He was not deterred. He worked construction for years after arriving here but became a steelworker at Armco Steel for thirteen years including an “essential job” during all of World War II. His love of construction never dimmed and in the late 1940s he and a partner bought a large dump truck and hope to try their fortune by starting a small construction company. The business was adequate but barely enough for the two partners to support their young and growing families. Somehow word got to Joe about an opportunity to go into the restaurant business. He did it because he thought he might be able to make enough money in the restaurant business to buy the construction equipment he thought would allow him to succeed in that business. His dearest friends were already in the restaurant business in Little Italy in Baltimore. These two men not only encouraged Joe to try the restaurant business but each helped him financially to get started. You may have heard the names of these two men if you are from Baltimore. One was Sabatino Luperini (of Sabatino’s restaurant fame) and the other was Enrico Vellegia (of Vellegias’ Restaurant fame). Having close friends who were in the industry helped Joe overcome any hesitation and a new family dynasty began. 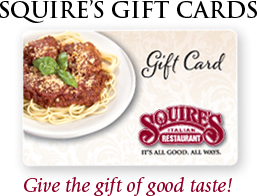 Squire’s was not the large multi-room restaurant familiar to East Baltimore residents today. In those days, the entire building was one room. The room in which today’s customers are greeted by the hostess used to be the entire building. Everything beyond that room has been added in a number of renovations over the years. The one and only dining room was dominated by a large “horseshoe” bar in the center of the room. The bar had standing room and stools for about 30 customers. There were also tables scattered around the bar that seated about 40 additional guests. Today the restaurant has a capacity of three hundred guests in four separate dining rooms. Back then, the entire place ran with the labor of Joe and Maria and a handful of loyal workers. Among them were John Coruzzi, retired owner of Pizza John’s Restaurant in Essex. Tony Russo and his wife Trudy, of Tony’s Pizza fame in Ocean City, were also part of the crew. Rounding out the staff was Vasco Calcara, of Lombardi’s in Ocean City. These men and women were the kitchen crew when Bob, Teresa and I were small children. It seemed like we were the University of Pizza! The building and property would be sold by Mrs. Squires to the Joe and Maria in the late 1950’s. The entire family made the pilgrimage to Pittsburg to negotiate the purchase from the elderly and ailing Mrs. Squires. It would be the only time in my life I would meet her. The clientele of Squire’s was varied. There were times when the restaurant was wall to wall military men. This was especially true at the end of the month when they received their monthly paychecks. Nearby Fort Holabird was still the induction center for the military in the eastern half of the United States. The G.I.s (enlisted men) would come to Squire’s while the officers went to the Brentwood and Karson’s Inns. This was also the heyday of American manufacturing. Besides the military base there were many factories in the area in the 1950’s – American Standard, Western Electric, Bethlehem Steel, Lever Brothers Corporation and General Motors. The end of every factory shift, some working around the clock, created regular periods of frantic activity at the restaurant. At first, Squire’s was mostly slating the thirst of these industrious (mostly) men with simple boilermakers (a shot and a beer). Early on Joe’s wife Maria had an idea. Surely she thought, some of these people must be hungry and might be willing to order a meal. From this simple idea and a HUGE amount of hard work an idea sprouted a business that would blossom into the large restaurant you see today. There was one big problem. There was no kitchen on the first floor to prepare food. Undaunted, Maria decided to use the small kitchen in our apartment upstairs to do the cooking. She started simply – a pot of tomato sauce and a pot of boiling water. Maria would walk down the steps and circle the bar asking customers if they would like a plate of spaghetti. When she had enough orders to fill the pot with spaghetti, she would scurry up the steps, turn up the simmering pot, cook the spaghetti, ladle on the sauce, tray it up and take it downstairs to the hungry customers below. Needless to say this was not efficient (or fun). Eventually, Joe and Maria decided to add a small kitchen to the rear of the restaurant. This increased efficiency and space allowed the limited menu to be conveniently prepared and expanded. Meat sauce and meatballs were added to the spaghetti menu and a new pizza oven made pizza, not a common food item on America’s menu in the early 1950’s, available for the first time in the area. Pizza and spaghetti are still two of the most popular items on our menu. The rest is not only our family’s history but also part of Dundalk’s history. How does one account for this rare record of success? The answer is people and the American dream. “People” does not mean just family. Thanks must go to the wonderfully loyal Dundalk community whose support for Squire’s has never wavered. Thanks are also due to the many hard working individuals who have worked with us all these years. It is not possible to thank them all. We would like to name those whose dedication is obvious from their length of service and titles. We start our thank you list with family members and the year they started. First and dear to our hearts is our deceased Zio (Uncle) Angelo who was our head chef for over thirty years. He retired and returned to Italy at the end of his career. Bob’s daughter, Mary, our dining room manager, started bussing tables in 1996. Linda Romiti, Lorenzo’s wife and CPA, did the accounting work for over 30 years. We were occasionally helped by Bob’s other children Robairta, (1997) and Joe, (2000), who began managing full time in 2014. As for non-related Squire’s family, there are many. While Bob and Lorenzo started together in 1964, one man has been here even longer than we have. He trained us in the kitchen when we were barely more than children. Richard Bell, general manager of catering, started out in the kitchen and has been working with us since early 1963. Richard has been an amazing asset to Squire’s. Lisa Burgamy started in 1978 as a seventeen-year-old carryout attendant and is now the office manager and comptroller. Lisa met and married her husband, who worked in the kitchen. Derrick Stewart joined us as a cook in 1982, and is now the night kitchen manager. Michelle Wilson (1988), has supervised all homemade pasta production, assisted in managing the dining room, and waits on lunchtime customers. Being our mother’s goddaughter, she is as close as one can be to family without sharing the family tree. Brandi Loftus started in our carryout in 1996 and is now our assistant catering manager. Jason McCarty (1997) is our head chef and day kitchen manager. Mike Franklin (1997) is our delivery manager, and Nicole Franklin started in 1999 and was our carryout supervisor until 2015. She now waits tables. Kristina Snyder, an employee since 1996, was our dining room manager for 14 years. Other long-term employees are Steve Haas, kitchen supervisor (1999-2014), Tom Hoar, expert pizza maker (2007), Rob Manger, expert line cook and pizza maker (2003), and Gary Durban, for his amazing soup recipes. Our management staff is augmented by many other employees, mostly Dundalk residents, that now counts eighty-five employees in an average week. As you can see, the story of this and nearly every successful endeavor is people. Another essential piece of the puzzle is location. I am not just referring to the neighborhood of Dundalk or even our address on Holabird Avenue. The American people and especially the people of Dundalk are resourceful and resilient. They have always found a way to keep moving forward. We are eternally grateful that they have included our family and our business as a part of their daily lives. Sixty five years and counting translates into a fourth generation of families who have celebrated their special occasions with us. From baptisms for newborns to wakes for the deceased, we are priviledged to serve the people in what we feel is still one of Baltimore’s great, old-fashioned neighborhoods. This is our thank you note to our co-workers, customers, friends and neighbors.